Lawrence Curtis Jackson (June 2, 1931 – August 28, 1990) was an American right-handed pitcher in Major League Baseball who played for the St. Louis Cardinals, Chicago Cubs and Philadelphia Phillies from 1955 to 1968. In 1964 he led the National League with 24 wins for an eighth-place Cubs team, and was runnerup in the Cy Young Award voting; he also led the NL in innings pitched and shutouts once each. Jackson's 194 career NL victories are the most in the league since 1900 by any right-hander who never played for a first-place team. A model of reliability, he won at least 13 games in each of his last 12 seasons. He later served four terms in the Idaho Legislature. Jackson was born in Nampa, Idaho, attended Boise Junior College and University of Idaho, and signed with the Cardinals in 1951. In 1952, he led the California League with 351 strikeouts and a 28–4 record for the pennant-winning Fresno Cardinals. He broke into the majors with St. Louis in 1955, posting a 9–14 record, and gradually worked his way into the starting rotation by 1958. He was named to the NL All-Star team in 1957, 1958 and 1960 while with the Cardinals, and allowed only two hits and no runs in 3-2/3 innings in the three appearances; the 1957 game was played at Sportsman's Park in St. Louis. In 1960 he led the NL with 282 innings and 38 games started, also winning 18 games, but he missed the first four weeks of the 1961 season after having his jaw broken in a late spring training game by a flying piece of Duke Snider's broken bat. After the 1962 season, Jackson was traded to the Cubs along with Lindy McDaniel in a six-player deal; the Cardinals received three players including Don Cardwell. Jackson was again an All-Star in 1963, and earned the win despite it being his least effective appearance in the Midsummer Classic; after entering with a 3–1 lead in the third inning, he allowed the tying runs, but the NL again took a 4–3 lead in the top of the fifth as he departed. He enjoyed his best season the following year, as despite the Cubs' 76-86 record he posted a mark of 24-11 with 148 strikeouts and a 3.14 earned run average. He also set a major league record for pitchers with 109 total chances without an error, breaking the mark of 108 shared by Three Finger Brown (1908) and Eppa Rixey (1917); Randy Jones broke his record with 112 for the 1976 San Diego Padres. With only one Cy Young Award for both leagues at that time, Dean Chance of the American League's Los Angeles Angels won the award with 17 of the 20 votes; Jackson received two votes, while Sandy Koufax received one. 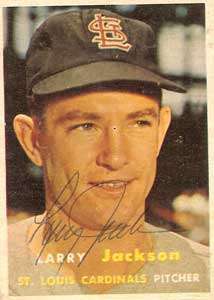 But Jackson followed up with a 1965 season in which he lost 21 games, becoming the first pitcher since Murry Dickson in 1951–52 to have 20 wins and 20 losses in back-to-back seasons. In early 1966 he was traded to the Phillies in the deal which brought Ferguson Jenkins to Chicago, and he ended the season as one of six pitchers tied for the league shutout lead with five. In 1967 he won his 171st game to pass Bill Doak, who had previously been the winningest NL right-hander of the 20th century to never play for a pennant winner. On June 20 of that year, he pitched a one-hitter against the New York Mets. After a 13–17 season with a 2.77 ERA in 1968, Jackson was selected by the Montreal Expos in the October 1968 expansion draft, but chose to retire rather than join the team; Bobby Wine was sent from the Phillies to the Expos the following April as compensation. In a 14-season career, Jackson posted a 194–183 record with 1709 strikeouts, 37 shutouts and a 3.40 ERA in 558 games and 3262-2/3 innings. He tied a record held by Claude Passeau by four times having the most total chances among pitchers with a perfect 1.000 fielding percentage (1957, 1964, 1965, 1968). Jackson became a Boise, Idaho, sportswriter, and also worked as an insurance agent and as a lobbyist for paper manufacturers. He went on to serve four terms as a Republican from Ada County in the Idaho House of Representatives, became executive director of the Republican State Committee, and ran for Governor in 1978 but did not get the party nomination. He died of cancer in Boise at the age of 59.